Praised by natural beauty Megan Markle. It can enliven your skincare routine while creating a more healthy, youthful appearance. A new study published by the New York Times shows that it can make you look 3 years younger. As it turns out, the secret to a firmer, younger looking skin might not only be in the products, but in facial exercises such as Facial yoga. Intuitively it makes a lot of sense. If we are holding a lot of stress and tension in our shoulders, neck, and facial muscles, wouldn’t that contribute to a tired look? If exercise helps to keep the rest of our body in a good shape, wouldn’t the same apply to our face? The basic premise of Facial yoga is that it helps to increase blood circulation to the face, neck, scalp and hair, enriching every cell with more oxygen and nutrients. According to Happy Face Yoga, one of the leading facial-exercise programs, the exercises help to restore the muscle tissue, elasticity and tone for a wonderful, glowing, youthful look. By effectively working the facial and neck muscles we help to reduce the impact of time, gravity and stress that may be showing on our faces. Essentially, Facial Yoga helps to strengthen the mind-muscle connection by using a mix of hands-on techniques such as massage, acupressure points, visualization and yoga breathing techniques. 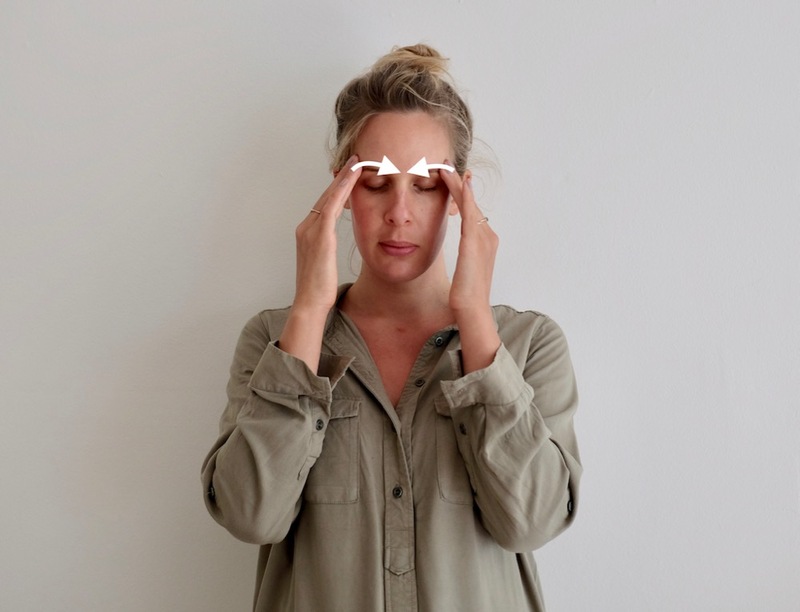 What I really love about the practice is that not only is Facial Yoga incredibly relaxing, but it can help take everyday stress and tension off your face, while boosting your energy levels. As with anything, it’s all about establishing a routine if you want to see results. I recommend incorporating Facial Yoga into your morning or evening beauty routine, that way it becomes a natural part of your day. It doesn’t have to take long, I suggest starting with just 5 minutes. Let’s be honest about it, we’re all busy. When you have established the routine you can start to build up to 15-20 min a day. This is what Facial experts such as Danielle Collins recommend. Why not begin right away with some of the simple exercises below? 1. With your hands slightly cupped, begin to lightly tap with your fingertips on the inner eyebrow right on the little bony structure sitting behind the eyebrow. 2. Follow this bony structure in a tapping motion all the way to the outer eyebrow. Continue tapping all the way back to the inner eyebrow and out again. Repeat x 10 times. 3. Now continue tapping from the outer eye to the inner eye following the bony structure under the eye. Reverse direction and repeat x 10 times. 5. Rub your hands quickly together, back and forth to create heat in your palms. 4. Begin tapping all the way from the inner eye, to the outer eye, to the outer eyebrow to the inner eyebrow and back towards the inner eye. Repeat 10 x times. 6. Cover your eyes with your hands feeling the heat on your skin and around the eyes. Hold for one minute as you so soften the whole face and let all the stress and tension melt away. Slowly remove the hands and blink your eyes open. 1. 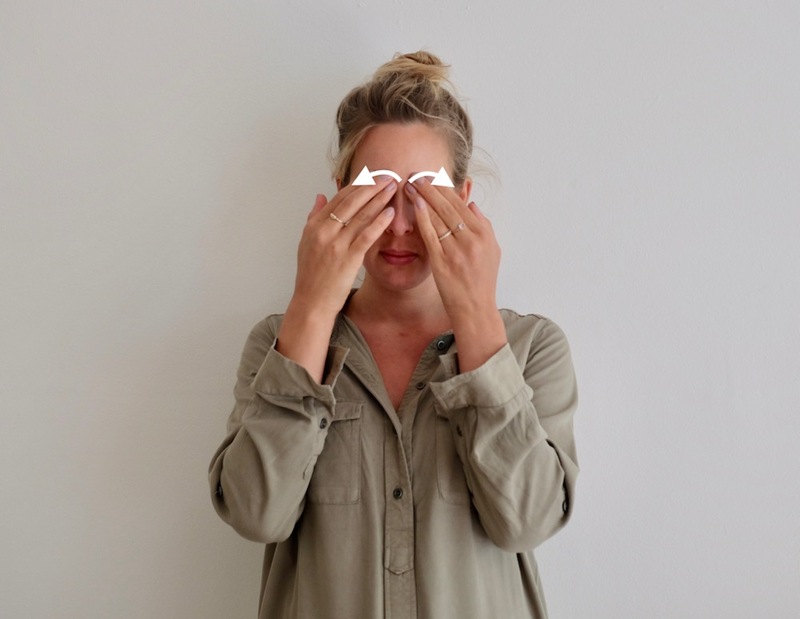 Place your three finger middle fingers on the spot between the eyebrows (known as the third eye) and pull down with light-medium pressure for 30 s.
2. Forehead separation. Using all fingers except your thumbs, starting at the center of your forehead. Apply gentle pressure and trace all the way out towards the hairline and temples. Repeat x 5 times. 4. Apply pressure to both temples and press gently as you close your eyes. Let your eyes and forehead soften. 1. Pinch your earlobes with your thumb and index finger and pull down gently while looking up. 2. Use your fingertips to massage your hairline. Starting at the top center of your forehead and tracing the hairline all the way down towards the ears. Repeat x 10 times. 3. Massage your jawline by applying a soft pressure with 2-3 fingers and moving all the way down towards the chin. Repeat x 10 times. 4. Massage the front of your neck using light downward strokes. Start from right under the chin and continue down towards the chest. Alternate your hands as your continue the repetitive stroking motion. Have you ever tried Facial yoga? Did you enjoy any of the exercises above? I'd love to hear your comments or questions!